Over the years, G.S. Wark has been awarded numerous “Zero Frequency” safety awards by the Construction Safety Association and the Ontario General Contractors Association for achieving outstanding safety performance on the worksite. G.S. Wark is an active participant in a local Regional Safety Group, administered by the Hamilton Halton Construction Association and the WSIB. Our current Health and Safety policy is available upon request. The Gold Seal Program is a National Certification Program developed by the Canadian Construction Association recognizing construction management on the basis of education, experience, and Gold Seal examination. At G.S.  Wark, our Project Managers, Estimators, and Site Superintend have been awarded their Gold Seal Certificates. G.S. Wark is proud to be an authorized Nucor Building Systems Builder. Nucor Building Systems, a division of Nucor Corporation, has been a leader in the design and manufacture of custom-engineered metal building systems for more than two and a half decades. By partnering with Nucor Building Systems, G.S. Wark is able to offer our customers a wide array of building solutions that are custom designed to your specific needs, yet cost-effective, efficient, and faster to erect. Plus, Nucor Buildings Systems products are proudly made in the USA from steel that is over 85% recycled so you can feel good about your choice to use a Nucor metal building. As a member of the Metal Building Manufacturers Association and certified by the International Accreditation Service, Nucor Building Systems’ manufacturing and engineering policies, practices, and procedures are audited annually. The IAS-AC472 accreditation process reviews raw materials, design specifications, software, building code compliance, and quality control procedures. The process assures the structural integrity and quality of our Nucor metal building systems. G.S. Wark is committed to providing our customers with the best possible products and services, and that’s why we use Nucor Building Systems. For more information on Nucor Building Systems, visit www.nucorbuildingsystems.com.